Admittedly, the Trinity is an interesting theory and it certainly quelled some of the early Church's division on the nature of God, but it is just that – a theory. …I'm not saying the theory of Trinity is wrong. I'm just not saying it's definitively right, which is exactly what many of its adherents do when they say that if you don't believe in the Trinity, you can't be Christian. Here's the thing, if the Trinity is that important, doesn't it seem like Jesus or the book of Acts or Paul or James or Peter or John would have talked more directly about it? The lack of biblical witness leaves me to believe that either there simply was no understanding of a Trinitarian God at the time books of the Bible were written, or that the concept was so unimportant to their faith that it mostly wasn't mentioned. Many conservative Christians believe perhaps some of what Sandlin says above. They think that while the Trinity is a concept that helps theologians overcome certain obstacles in reconciling some snippets of scripture, it is more esoteric and "head knowledge" than the central message of the gospel, which is the message we should truly be sharing. If you believe something like this, may I tell you in the kindest way possible that you are completely wrong? Because you are. As Dr. Fred Sanders wrote in his compelling book The Deep Things of God: How the Trinity Changes Everything, "the doctrine of the Trinity inherently belongs to the gospel itself. "2 Let's look at some aspects of the work of Christ's atonement on the cross to see just how dependent it is on the concept of the Trinity. Notice how Paul makes a distinction in the passage above with the words God and Christ. He argues that a person giving up his own life for a righteous man would be a great sacrifice; it would mean more that a person gave up his life for an unrighteous man. However, we have been "reconciled to God by the death of His Son." It's one thing to lay down one's own life, which Jesus did in following the will of the Father. It's a completely different level of sacrifice to lay down the life of your beloved son for the sake of an enemy! Without the concept of the Trinity, this level of sacrifice is missed. …So Christ, having been offered once to bear the sins of many, will appear a second time, not to deal with sin but to save those who are eagerly waiting for him. Jesus needed to appear in the heavenly realms, in the true Holy of Holies to atone for sinful humanity. He couldn't be just a man, as a righteous man might be able to pay for the sins of an unrighteous man, but Jesus paid for the sins of all flesh. The atonement is not the full Gospel. Any presentation of the Gospel message must not stop at Christ's death, but also include His resurrection. We know that without the resurrection of the dead, "you are still in your sins. "4 Jesus said that his resurrection was his own to do,5 and Paul tells us that our future resurrection from the dead depends on God's Holy Spirit, who also raised Jesus: "If the Spirit of him who raised Jesus from the dead dwells in you, he who raised Christ Jesus from the dead will also give life to your mortal bodies through his Spirit who dwells in you. "6 Thus, without the Trinity, there would be no resurrection and no hope for us. We would be "of all people the most pitied." 1.Sandlin, Mark. "No Trinity For Me, Please." Patheos. Patheos, 20 Aug. 2014. Web. 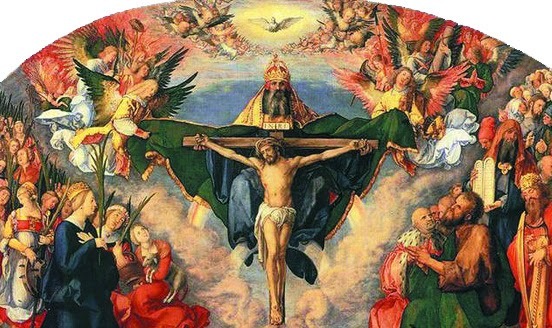 04 Sept. 2014. http://www.patheos.com/blogs/thegodarticle/2014/08/no-trinity-for-me-please. 2.Sanders, Fred. The Deep Things of God: How the Trinity Changes Everything. Wheaton, Ill.: Crossway, Kindle Edition, 2010. 9. 3. Romans 5:7-10,ESV Study Bible: English Standard Version. Wheaton, Ill: Crossway Bibles, 2007. Print. When you impose the Trinity you ignore the gospel because now its all about believing in a 3-headed Cerberus god rather than in Jesus as the Christ and Son of God (Matt 16:16), and so the confession which Jesus told Peter is the rock on which he would build the church becomes the stone which the Trinitarian builders rejected.